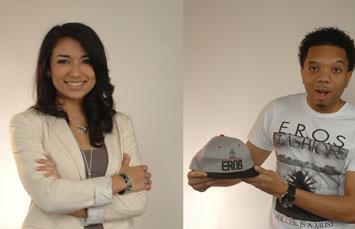 CoB students Cristy Asturias and John McCann started their own businesses. She spent last summer interning at that same Thailand factory that produced her first work, learning all about the production side of the business and creating more sketches. She is inspired by the images that Louisianans hold dear and the meanings behind those images. Asturias now oversees the newly opened family store, Sterling Silvia on Magazine St. She knows that for the next 5 – 8 years, that store will be her life—her baby. Just like it was for her parents when they first started 20 years ago—and that’s okay with her. It all started with a class assignment when John McCann—or John Mac as he’s known to the really cool—was a first-semester freshman sitting in an Intro to Business class at Loyola. The assignment was to write a business plan for a fictional company of the student’s choosing. Since one of McCann’s interests has always been fashion, he wrote a plan focused on launching a clothing line. At the end of his first year in the CoB, he decided to act on that plan, and his retail clothing line E.R.O.S. was born. E.R.O.S. stands for Everyone Rises Over Struggles, and with little help and zero funding to date, he’s in business—figuring it out as he goes. McCann oversees all aspects of the operation from development to production to shipping. Some of the pieces in the line, which includes t-shirts, sweatshirts, cardigans, caps, and beanies, are manufactured in-state with others produced in China at federally-approved manufacturers. It takes about three weeks to a month for the finished product to arrive from China, so McCann is always working six months out—planning product releases. His inspiration for his clothing line comes from random creative moods and sources—music, art, objects—that he finds interesting and moving. 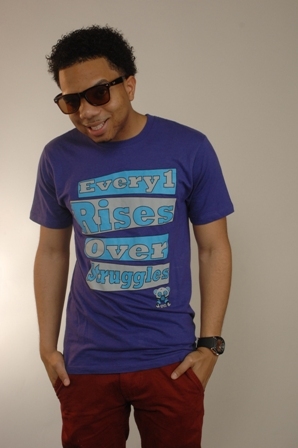 The brand is targeted to young people (12 – 25 year-olds) who relate to the E.R.O.S. message of “Fashion with a Purpose.” Sometimes McCann will create pieces with a particular fundraiser in mind with proceeds going to causes including education or specific nonprofits like Covenant House. The brand is available online and in several local shops. The Loyola marketing major lives his brand, bringing his message, as a motivational speaker, to area schools and community groups. He tries to make his audience understand that they must always have faith and work to overcome the struggles life throws at them. McCann’s faith has its roots in God, and he encourages the young people to whom he speaks to find the roots of their own faith. McCann is working on a new business plan—one with many more details so that he can grow his business and realize the success he dreams of—a true testament to rising over struggles. 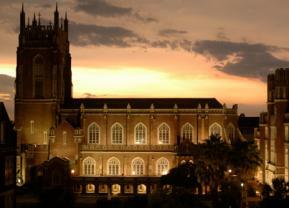 View the complete spring 2012 issue of Loyola Executive.